Combine 2/3 cup evaporated milk, onion, crumbs, salt, allspice and pepper. Add meat; mix well, chill. Shape meat mixture into 1-in. balls. 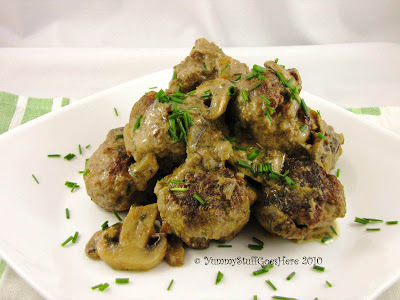 In large skillet, brown meatballs in butter. 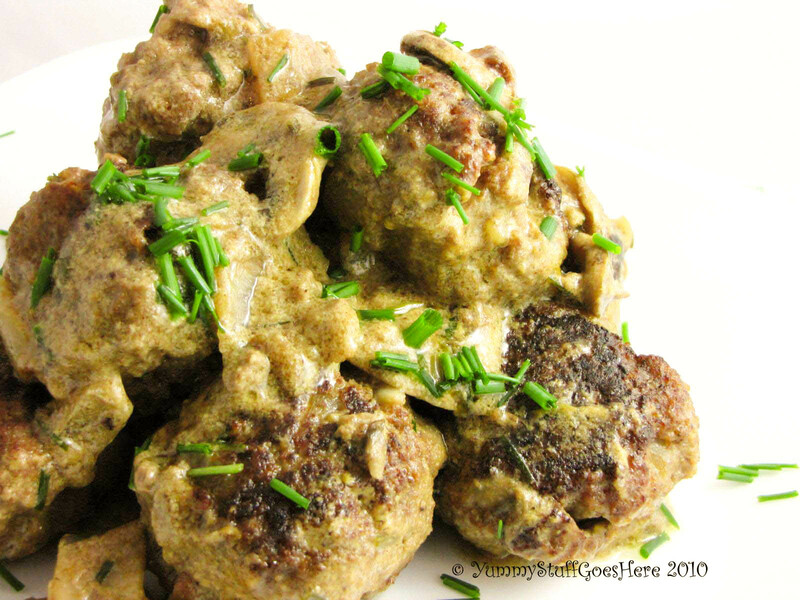 Dissolve bouillon cubes in boiling water; pour over meatballs and bring to boil over medium heat. Cover; simmer for 15 minutes. Meanwhile, blend together cold water and flour. Remove meatballs from skillet, skim fat from pan juices and reserve juices. Stir 1 cup evaporated milk and flour/water mixture into pan juices in skillet; cook, uncovered, over low heat, stirring until sauce thickens. Return meatballs to skillet. Stir in lemon juice. Serve with cooked noodles or pasta or in my case rice ;) Oh yeah and I cheated, I added mushrooms to mine coz I love them. Eating it now, can really taste the spice coming thru the meat and it is so moist and tender. A friend of mine from my SQ days recently celebrated her birthday. 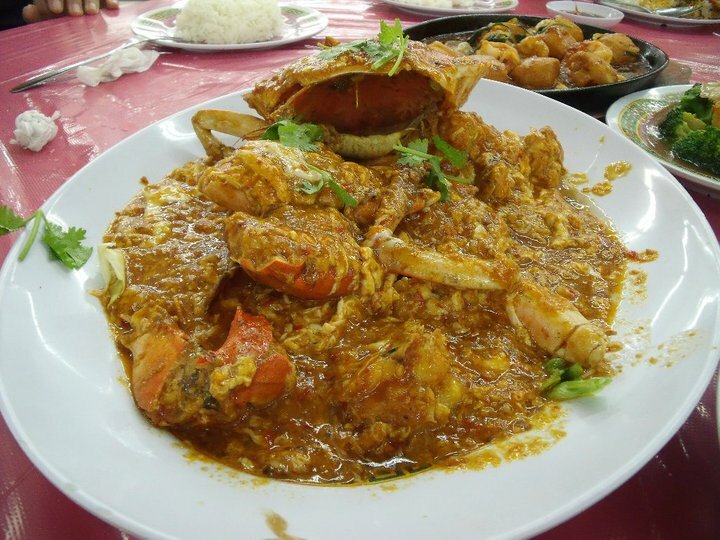 This was no ordinary celebration, it was a grand feasting of sumptious seafood and she is one very lucky gal. 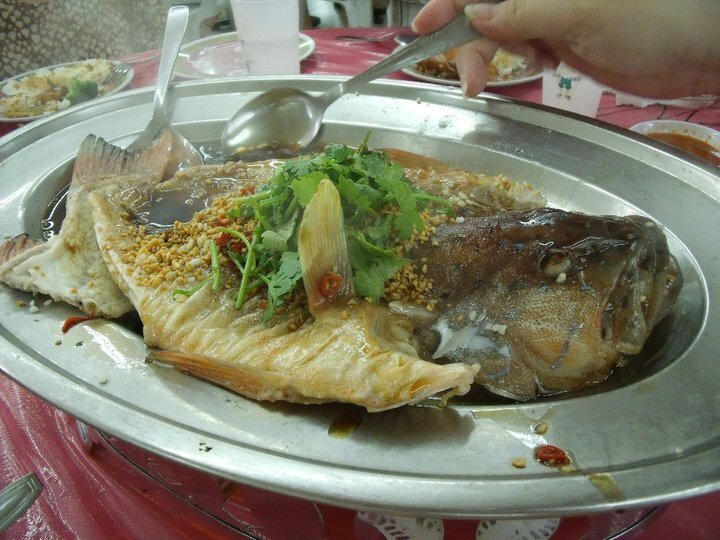 I was envious when I saw the photos, this was close encounter of the seafood kind. There was chilli crab, salted egg crabs, oatmeal prawns, squid. Drool factor....10 out of 10!!!! Yummy stuff... not to be missed! Now I haven't tried these myself, I will have to, on my next trip to Singapore. 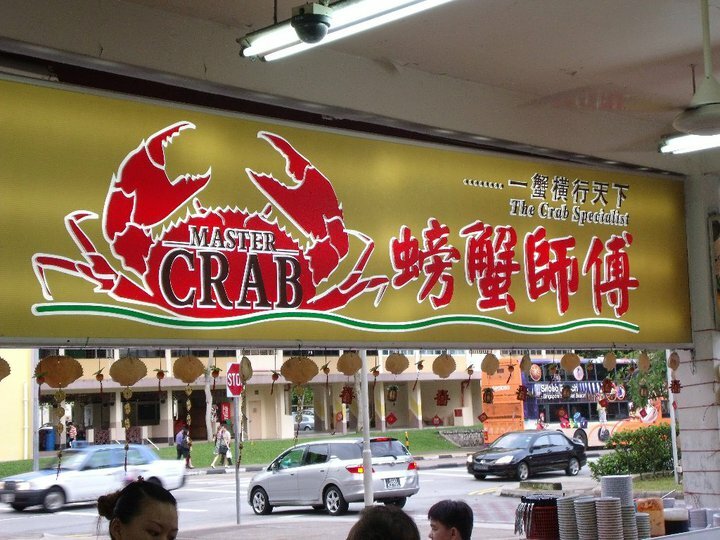 I have been told that the crabs are fresh, succulent & juicy. To conclude, this rating is from Josephine herself; meanwhile I will just have to drool at her photos and wait for my return to Singapore in near future. "This seafood joint is at Ghim Moh road block 19 just opposite Ulu Pandan CC. 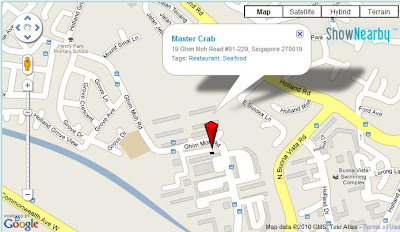 I can rate it 7/10 for the crab compare to Ang Mo Kio Blk 232 Melben crab." Why mango? It was in the fridge and it was taking forever to ripen and I went Meh! What the heck? Let do a mango salad... but then Lucy decided that it was too cold for a salad, let's do a kung pow chicken and chuck some mangoes in....what's the worst that can happen? So it turned out rather nice, otherwise I would have pick all the mangoes bit out of the dish at dinnertime. 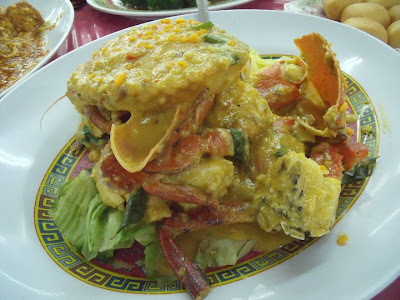 It added crunch and sourness to a spicy dish. This is a very simple stir fry chicken with the guest star apperance of the mango. The stirfry sauce is just a mixture of sugar, salt, soy sauce, fish sauce, garlic and chillies. Tossed that around, add fresh coriander, throw in some peanuts for some crunchiness, and sesame seeds to add texture. I was tossing up to julienne the mango or just slices... julienne would have been good for light and refreshing salad and I thought it would have died in the stirfry and so we ended up with chucks of sliced raw mangoes instead. The fish sauce and coriander goes really well with chillies paste and it made this chicken dish popped for me! Like KabOOOM!!! As below.. simple, fast and no mucking about... especially when you are starving...if you like more fire, add some freshly sliced baby hot chillies..
Bamboo shoot, banana, bitter gourd, clam, crab, grapefruit, lettuce, persimmon, salt, seaweed, star fruit, sugar cane, water chestnut, watermelon, lotus root, cucumber, barley, bean curd, chicken egg white, marjoram, oyster, pear, peppermint, radish, strawberry, tangerine, and yogurt, broccoli, cauliflower, zuccini, corn, tomatoes, pineapple, turmeric. Honey, corn, abalone, apricot, beef, beetroot, black fungus, carp, carrot, celery, chicken egg yolk, cuttlefish, duck, fig, kidney bean, lotus fruit and seed, milk, olive, oyster, papaya, pork, potato, pumpkin, radish leaf, red bean, plum, sunflower seed, sweet rice, sweet potato, white fungus, yellow soybean, brussels sprouts, snow peas, sweet potato, taro, dates, figs, raspberries, raisins, sage, rosemary, thyme, brown rice, apple. Pretty exciting stuff, huh? Mind numbing indeed, now I have to go figure out what I can eat tonite... bye for now..
Yipppeeeee...another road trip, we went down to Albury for Dave's farewell lunch today. It was fantastic, I love the pub immediately on walking in. Took several photo shots of the place. The staff were friendly, there was a cute guy behind the bar, the food was fab, the beers were cold, what more could you ask for? I have to say, this was the best honey prawns I have ever had outside of a chinese restaurant. The salad dressing was interesting, I don't recognised it but it was delicious. I wished I had asked what it was. Helena had the chicken filo mornay. Campbell ordered Bangers and Mash. I wonder if that is black sausages? I didn't want to intrude so I didn't take a lot of food photos, just those around my side of the table. 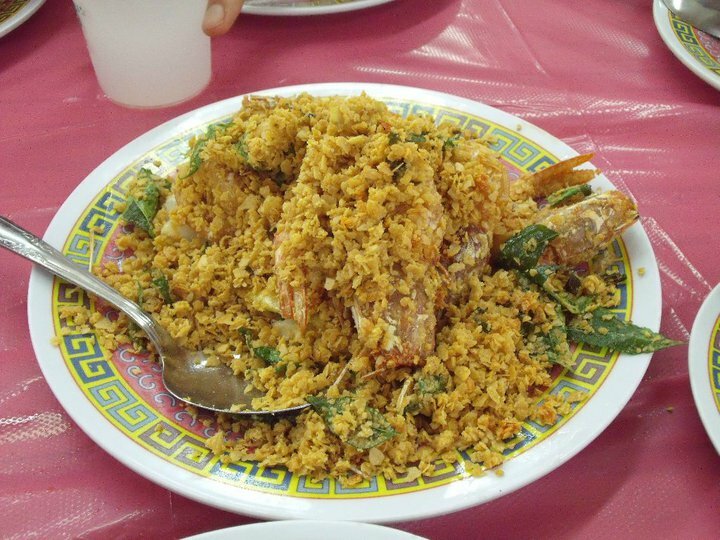 A lot of Asian ladies eat this dish just after childbirth, but I think that one does not have to be in a confinement period to enjoy this lovely simple dish. I cook this whenever I am feeling unwell. 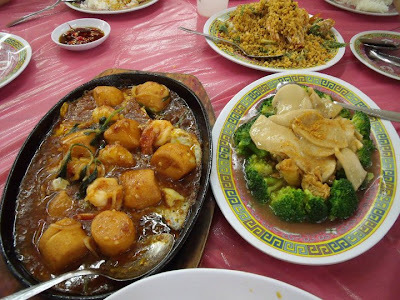 Today, we are having this for dinner as I find the aromatic smell of the ginger frying and the sesame oil soothing to my senses. I believed that the ginger also helps with my nausea. Plus that I am starving after being sick.....and this simple dish is so good for you during the winter months, it warms up your body. 2 chicken breast or chicken portions with bones in. Pour in generous amout of sesame oil. Serve up and put crunchy ginger crisp toppings on top.